The Air Mesh upper unit provides breathable coverage. The Lyrca ComfortFrame in the upper makes the material stretchable and agreeable to the skin, letting the runner wear it without first using socks. The TPU External Heel Counter locks the rear section of the foot and keeps it in place, effectively preventing accidental shoe removal. The padded tongue and collar deliver comfort and snug security. Runners appreciated the Early Stage Meta-Rocker design in the midsole, which encourages better performance and propulsive movement. Many runners took note that this shoe is very comfortable. Some heavyset testers complained that the outsole unit wore off too easily. This shoe’s forefoot area was a bit narrow and tight for some runners. The Bondi 4 lacked proper arch support, as noted in some reviews. This shoe has an expensive price. The Hoka One One Bondi 4 provides a smooth and well-cushioned ride. The overall construction and technologies used in this shoe provide responsiveness, support, and comfort. This shoe was designed for road running, but it has enough traction for dirt tracks. I am here to review the Hoka One One Bondi 4 which can be described as a very cushioned training shoe that can be seen as “moon shoes,” “shape ups,” or even clown shoes. Despite the look, the Bondi 4 is a good option if you are looking for a comfy shoe for any type of activity. A few things to point out from the start is that they do carry a fairly hefty price tag to them and they are fairly clunky as one might expect when taking a first look at them. What can I say about the look of these shoes? These things are out of this world (literally). One might be confused these with moon shoes since there is so much cushioning under your feet. 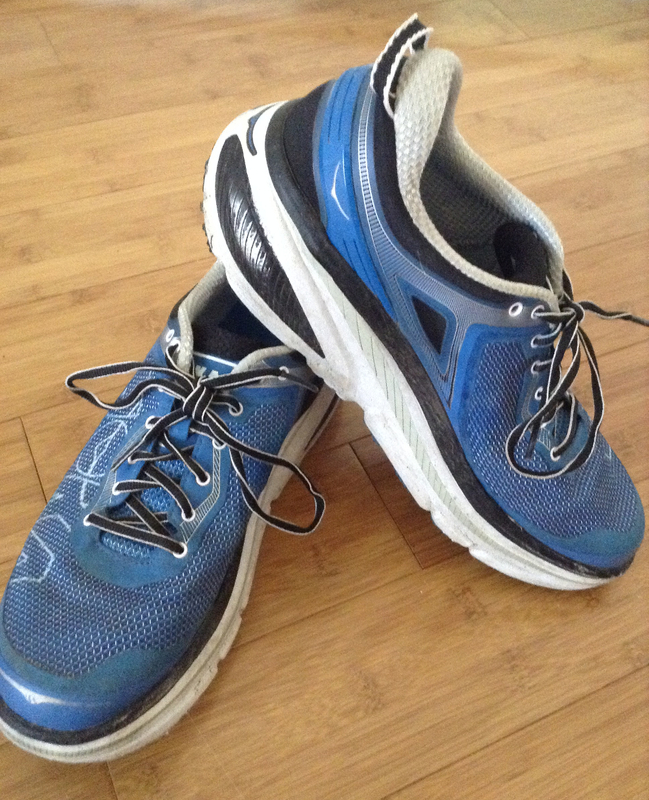 Hoka does not make the prettiest shoes on the market, but the performance of these shoes are incredible. That is what truly matters at the end of the day. If you aren’t launched into space after a few steps in these, I think you will enjoy the ride offered by these Hokas. I currently own the Directoire Blue version, and I like it a lot. The Bondi 4 is a fairly snug shoe that I enjoyed for the most part. The TPU External Heel Counter locks the rear section of the foot and keeps it in place between the tongue and collar of the shoe. The toe box has been noted to be narrow by some, but I didn't have an issue with the width of the toe box. The shoe did have some issues with the arch support though. My feet tended to get a lot of nasty blisters right on the arch and were not very fun to deal with. I don’t know if that was just me or if others have had that issue, but I would implore you all to test them out first if you can to get a feel for them. I tended to get the nasty blisters on longer runs (8+ miles) but did not have issues on shorter recovery runs and easy runs. The Bondi 4 seems like it is a pretty durable shoe thanks to all of the cushioning underneath your feet as well as a tough upper that doesn’t seem too likely to tear in my opinion. The shoe does provide a fair bit of responsiveness with each step you take, but the weight is something that will definitely impact the springy responsive feel as the run goes longer and longer. Long runs can be a struggle due to the clunkiness of these shoes and the shoes feel like bricks on your feet. Some of the pros to the Hoka One One Bondi 4 is that it is the most cushioned shoe in the Hoka brand, however, with so much cushioning comes added weight. For a men’s US size 11, it comes in at a weight of 11.20 ounces which is fairly heavy. Some people recommend these for long runs, but I tend to keep these away from really long runs (10+ miles) since these starts to feel very heavy the longer you go on. More so, there are definitely other high cushioned shoes that can aid on long runs of that nature (Hoka One One Clifton 3 for example). The Bondi 4 has both its pros and cons as does every shoe. The Bondi 4 offers an incredibly smooth ride offering tons of cushion for any run. However, these shoes are heavier than I expected to be wearing. I would definitely say that the pros outweigh the cons and that these shoes are definitely worth a try if you can find them for a good deal. If you have to pay full price, I’d recommend trying out the Clifton series or even just bumping up to the Bondi 5 at that point. However, these should drop in price a fair bit so I would try them out if you have not yet. See for yourself, and I hope that this review has helped! It's great for long runs. Honestly, you can just throw a ton of miles at this thing, and it's really gonna kinda depend on how your body can put up with the miles, because the shoe will just go and go and go, and provide you with max cushion the entire way. The Hoka Bondi gives you maximum cushioning, maximum protection, and yet at a relatively lightweight package. The Bondi 4 is the quintessential Hoka One One, with all the necessary ingredients of Hoka One One’s maximal midsole alchemy. Its stack heights (33 mm rear, 29 mm front) towers above most, and is rivaled only by its closest relative – the Stinson. 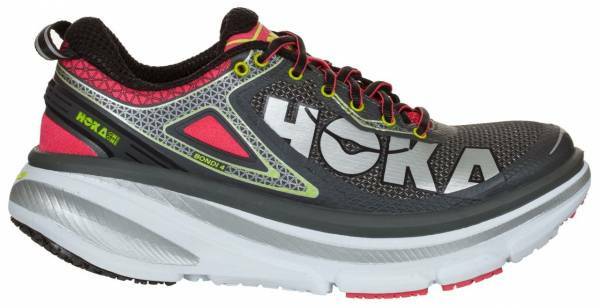 The 4th version of the Hoka One One Bondi comes with a new and enhanced upper. The stretchable property of the fiber was designed to give maximum comfort and a sock-like fit. It features a new TPU External Heel Counter that offers a secure heel fit. It also gives added stability and support around the rear foot that is just right for neutral pronators. The updated padded tongue compliments well to the enhanced upper construction of the shoe. The foam in the tongue offers additional comfort to runners. The Hoka One One Bondi 4 comes with an enhanced outsole unit to help runners experience a smoother transition. The new outsole of the shoe offers increased ground contact and durability. The Bondi 4 has a standard sizing. It comfortably accommodates medium-footed runners since the heel, midfoot and forefoot areas are of standard measurements. Those who experienced a good fit with the Hoka One One Bondi 3 will experience the same fit on this version. The Hi-Abrasion Rubber that is very lightweight was purposely placed in the shoe’s outsole for enhanced traction and durability. This made the shoe not only ideal for road running but also for light trails. This could also be found in the Bondi 6, which is currently the latest iteration of the series. The Hoka One One Bondi 4 provides a smoother heel transition through the 10 Deg Heel Bevel. The Heel Bevel is new to this version that increases durability and ground contact. The midsole of the Bondi 4 uses the full-length soft EVA foam. It is 30% softer compared to the traditional EVA foam. The soft EVA in the entire midsole provides an enhanced cushioning and additional support. The Early-stage Meta-Rocker element was placed behind the metatarsal heads. It is designed for increased propulsion and to deliver a smoother ride. The Bondi 4 has an air mesh on its upper. The air mesh comes in lightweight construction and gives excellent airflow for unmatched breathability and comfort. The upper unit uses the Lycra ComfortFrame that is highly stretchable. The lycra fibers give runners a sock-like feel and its recovery properties offer added shoe durability. For added medial and lateral support, the shoe utilizes the TPU External Heel Counter. Aside from the added stability it gives, this technology also offers a more secure fit in the heel area. Another element found in the upper that compliments well with the breathable air mesh and comfortable sock-like feel are the padded tongue. The enhanced shoe tongue gives added comfort to runners.